The year 2004 witnessed the fledging of yet another feather – or quill, if you will – in the artistic destination cap of Winona, Minnesota. That year was the first of fourteen seasons of wonderfully staged plays of William Shakespeare. Given also the Bard’s skill in writing the sonnet form of poetry, (154 in total), quite soon an idea was hatched between Winona’s then-Poet Laureate, Professor James Armstrong, and the directorship of the GRSF company. Thus, 2008 became the first year of the Great River Shakespeare Festival Sonnet Contest. In 2012, the Contest was renamed in memory of Maria W. Faust: a Winona State University graduate in Communications; a twenty-year resident of Winona; an avid supporter of varied local arts; and a lover of poetry. We of the Sonnet Contest very much appreciate your interest, and welcome you to our web page, which includes guidelines for entering the Contest. 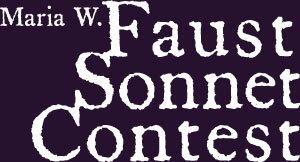 The 2019 Sonnet Contest is now open. The deadline for entries is June 1, 2019. Click “How To Enter” above for detailed instructions. Or click “Entry Form” below to go directly to the form. The winners of the 2018 Maria W. Faust Sonnet Contest were announced on Saturday, August 4th during our Closing Event. Click here to for the contest results and to read the winning entries.